There is no freighting charge for click and collect orders. You can check store availability by clicking on the “Find in store” button next to each product. While we endeavor to have as many items in stock as possible, your item may be out of stock. If this is the case, we will be in touch to notify you of the delay. How long before I can pick up my order? Most orders will be ready for you to pick up in store within 1-3 working days.The store will be in touch with you via phone to confirm when your order is ready for collection. Where is my order processed? 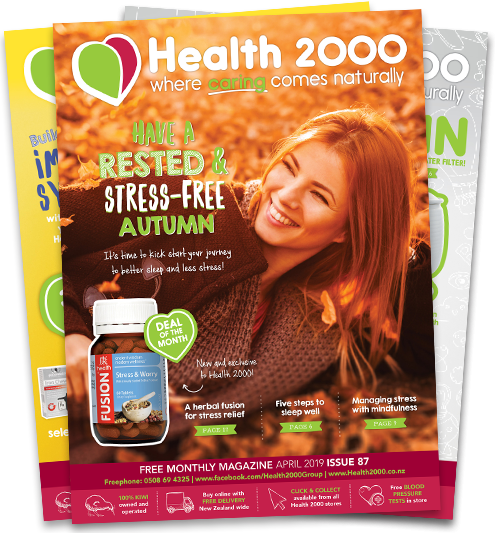 All click and collect orders are processed through the Health 2000 webstore, located at 408 Anglesea Street in Hamilton. You will receive a confirmation email from PBT when your parcel departs our webstore for your selected store.Your selected store will give you a call to let you know when your order is in store and ready for you to collect. Please note that exclusive online deals and offers may sometimes exclude click and collect orders. For more information, or if you have any questions about how this process works or the progress of your click and collect order, please contact us on info@health2000.co.nz or call 0508 69 4325.